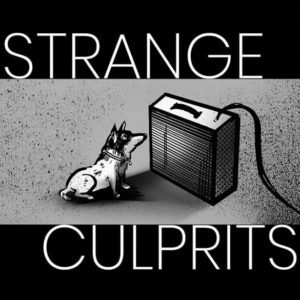 The Bay Area’s Strange Culprits have released their self-titled debut of 9-songs, and it’s pretty much a killer. With Samantha Buckingham’s bass laying a low flumping opening to the simple, slightly relentless opener “Moonlight,” we get a pretty desolate feel from the lyrics with Jason Buckingham’s limited but very soulful voice. The second tune, “When You’re Away,” presents even more of a popping beat from drummer Tony Loftin and works even better for me. Again Jason Buckingham is a’searching and a‘yearnin’ in his lyrics. “Rootless,” presenting one of the better vocal moments from Jason, has a nice sweetness to it, even in the maybe slightly too loud flang-y guitar strumming. Here Samantha B provides the orchestration with her bass. And I so dig “Bless The Harlot,” this one has got every little nuance that makes Strange Culprits what they are; three instruments locked together but still proving enough individual color, Jason Buckingham at his most soulful singing, and the lyrics, again, have a real resonance and true substance. Synth strings hit you on the start of last tune here, “Concrete In The Rain.” A slow arpeggio piano, Loftin locked into the big beat, and a single-note electric lead sails over the entire big production as it fills out. With another stunning vocal from Jason B this is the tune most unlike any other and a welcome surprise. Whoever these Strange Culprits are, they are certainly making some very cool music on their debut.